The word "fierce" comes to mind when I look at the new-for-2015 Versys 1000 LT from Kawasaki. Influenced by its sport-bike styling, Kawasaki took the Versys 650 look and redesigned the front end and horizontally arranged headlamps to give the 2015 Versys 1000 LT a fierce and fearless look. 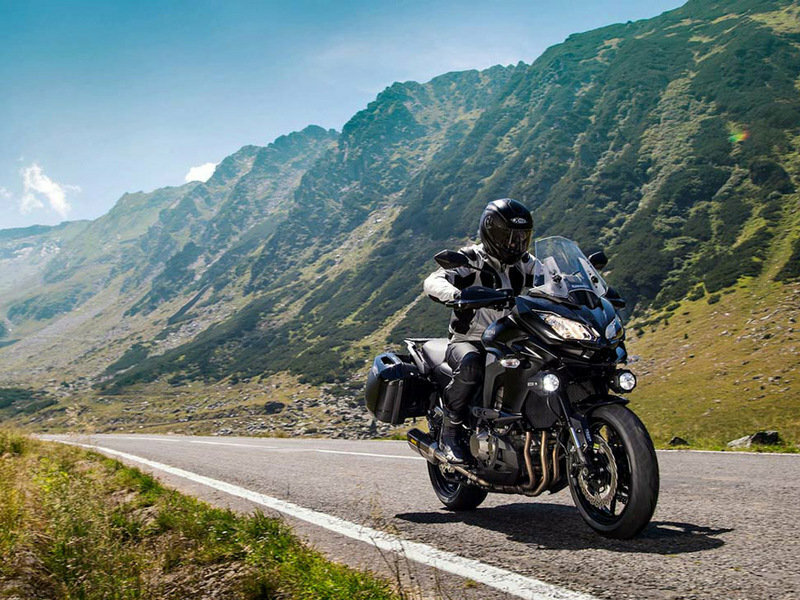 Kawasaki calls this an "adventurous Euro-tourer," but it also has the heart and soul of a sport bike. Continue reading to learn more about Kawasaki Versys 1000 LT.
With a seat height of 33 inches, it’s a bit too tall for me, but the flat and tapered-at-the-front seat makes it easier to find the ground without the awkward, bow-legged scramble. 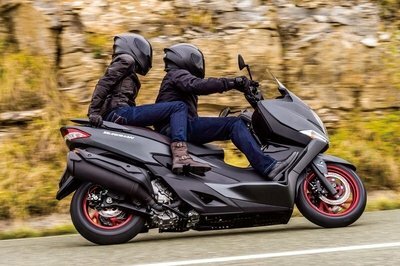 I like the upright posture for the rider and passenger; it’s so much more comfortable for long road trips. 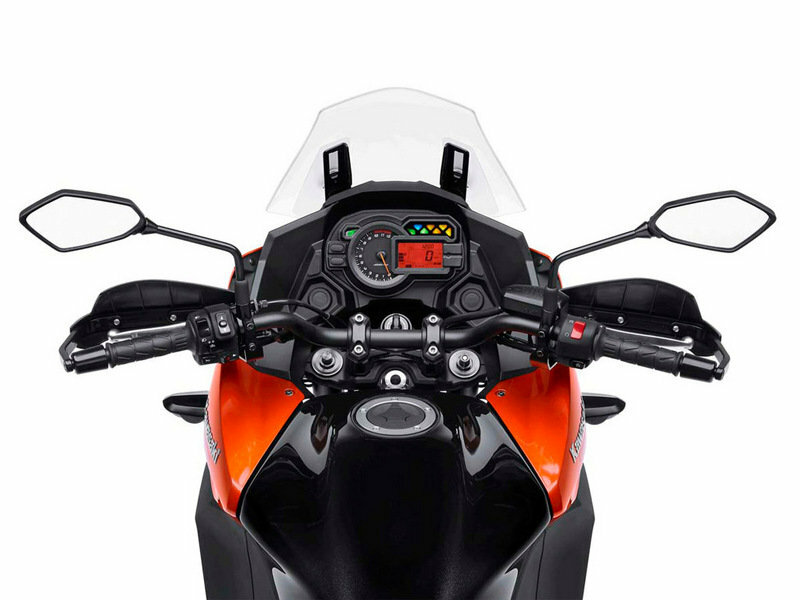 The adjustable windshield — with 2.6 inches of adjustment — allows you to set the windshield height to avoid neck fatigue or increase airflow through your helmet vents. 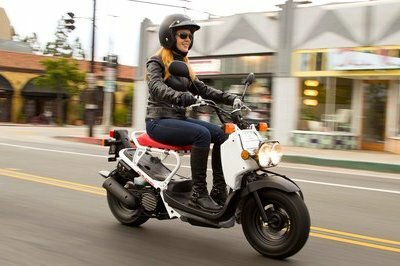 The color-matched, hard saddlebags, enhanced with Kawasaki’s Quick Release (KQR) system, give 6 gallons of storage space, and the one-key locking system means you only need the ignition key to get into everything. The KQR systems allows you to remove the bags without tools; it’s always a plus when you don’t have to fuss. For additional storage, get the optional top case and have room to stow two full-face helmets, all still using the one-key system. The KYB 43 mm inverted front fork and horizontal back-link shock in the rear, both with adjustable rebound damping and almost 6 inches of travel, smooth out the rough roads and give you a comfortable ride on the long haul. Dual 310 mm petal rotors with four-piston calipers in the front and single 250 mm petal rotor with a single-piston caliper in the rear provide braking force. ABS and the three-mode Kawasaki Traction Control (KTRC) system mean skidding is a memory. The KTRC system offers two modes for optimal sport-riding performance and one mode for slippery roads. The 1,043 cc four-stroke, liquid-cooled, DOHC engine is an inline-four, which I’d expect to be pretty torquey. I’m not disappointed. 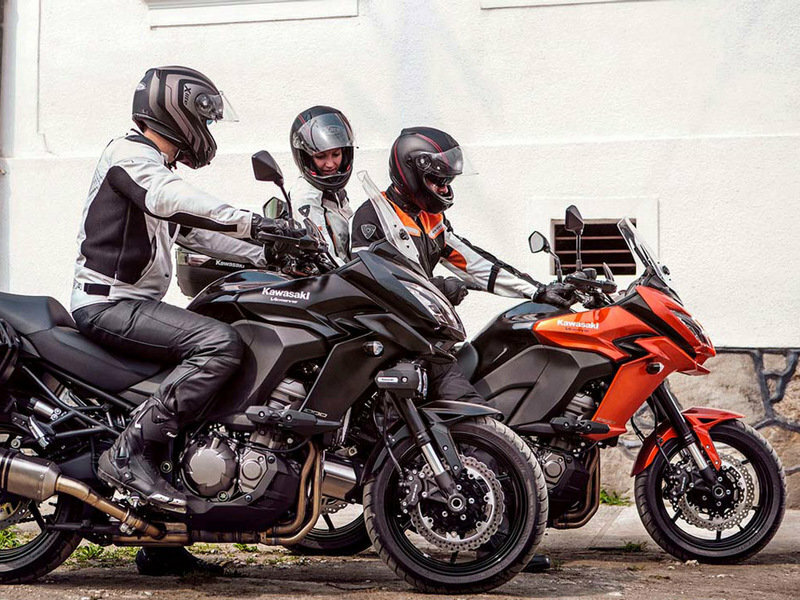 At 75 pound-feet of torque, the Versys 1000 LT has good roll-on for ample passing power. Four valves per cylinder allows the engine to breath and aids in exhaust-gas scavenging, which helps provide a fresher air/fuel charge for each compression stroke. With a compression ratio of 10.3 to 1, the engine needs premium gas to keep it purring. The Assist and Slipper Clutch, similar to those on racing bikes, reduces shift-lever effort, giving you better shift control and reduces rear-wheel hop when downshifting. 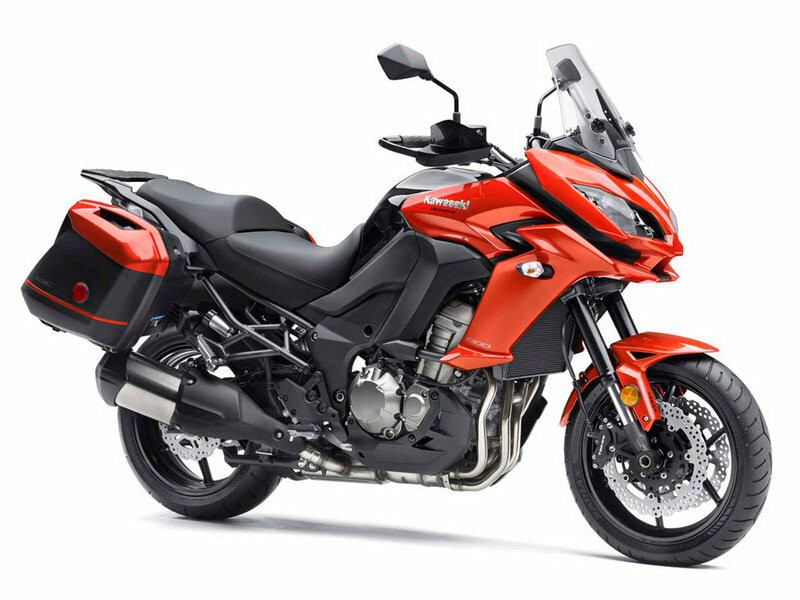 MSRP on the 2015 Versys 1000 LT is $12,799 — very doable for getting a sporty touring bike without breaking the bank. Of the two paint options — Candy Burnt Orange/Metallic Spark Black or Flat Ebony/Metallic Spark Black — I’ll pick the Flat Ebony/Metallic Spark Black because I’m not an orange person. My husband and fellow writer, TJ Hinton, says, "This bike is a bit too tall, even for me, but I do like the aggressive styling. I find it very similar to the look of the Ducati 1200S, but a whole lot cheaper. Overall, it looks like a whole lot of bang for the buck." 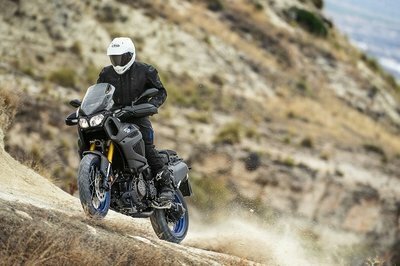 "The Versys 1000 LT is very Batman with that fierce, pointy styling, and is very affordable for what you get. It’s too tall for me to ride, but sitting on the pillion, I like the passenger handgrips. It has a strong, ballsy engine, though some might think it’s overkill putting a 1K+ cc engine on what could otherwise be a 650."